Icon, administrative center, antique: these are just a few words that describe our beloved administration building, Bresee Hall. However, what you may or may not know is that this building consists of three sections, each dating from a different period of the school’s history. Construction of the administration building began in 1918, under the presidency of A.K. Bracken. This photo (on the left) from 1918 or 1919 shows the construction of the administration building and shows the stone sign bearing the name Oklahoma Holiness College. 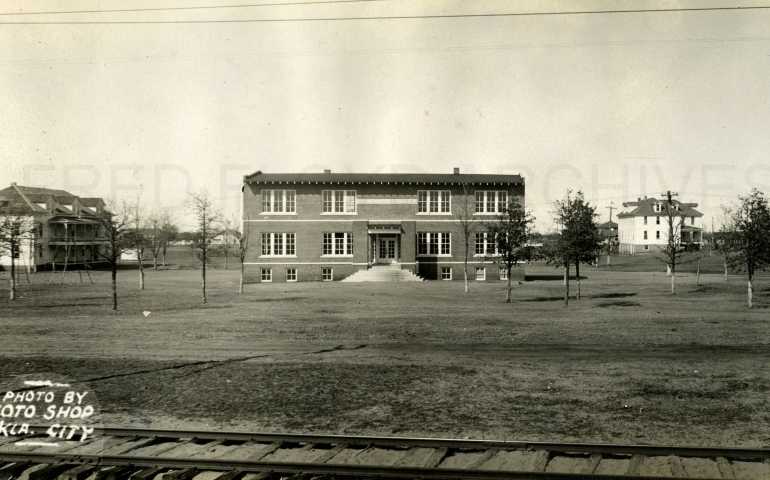 This building was completed in 1920 during the one year that the school was known as Oklahoma Nazarene College. This 94-year-old photo (on the right) is an excellent panoramic of campus as it appeared in 1920. On the left is the men’s dormitory, which once sat in the now-empty lot behind Herrick. Bresee Memorial Building, as it was originally known, stands center, with the women’s dormitory on the right, on the site of the future R.T. Williams Learning Resource Center. When this section was built, this very narrow building was home to the library, classrooms, and the President’s office. Today this building still stands sandwiched between the north stairwell/elevator and the tower. In 1940, under the presidency of A.K. Bracken, ground was broken in front of the Old Administration Building. The groundbreaking starts at 10:47. At the steering wheel of the tractor is Rev. C.B. Strang, pastor of Bethany First Church from 1940-1949. At the handles of the plow is Rev. O. J. Finch, Bethany Peniel College president from 1944-1946. This color footage of the groundbreaking is especially fascinating as the color film format was expensive for home recordings. The front half of the three story building facing 39th St. was added and given the name Bresee Hall in honor of the Church of the Nazarene founder, Phineas Franklin Bresee. This new building housed the library,president’s office, and other administrative offices. The new building was connected to the old building through wide corridors in the basement as well as on the first floor. The tower was used for Student Council offices, and also housed the Arrow and Echo offices. Crowning the top of the tower sat a clock (pictured on the right) donated by the Senior Class of 1941; this clock still keeps time in the newly renovated Fred Floyd Archives. This fantastic little photo (on the left) from the mid-1940s gives us a perfect view of the new addition to the old administration building. If you zoom in, you will see the Class of 1941’s clock and the Class of 1943’s gift of a neon sign, which used to crown the tower of Bresee Hall. In the 1960s the building received extensive renovations, which included connecting the two separate buildings into one large building, which has remained unchanged since. During this renovation, the original stone Oklahoma Holiness College sign was removed and placed in the rock garden in front of the prayer chapel where it can still be seen today. The last part of the building was added in the early 1990s, under the presidency of Loren Gresham. This addition provided stair and elevator service to all floors of the building. Bresee Hall has been used for almost every department on campus at some point in the school’s 115-year history. Today, our beloved building houses the offices of the President, University Advancement, Church Relations, Academic Affairs, Financial Affairs & Assistance, Enrollment & Registrar, Human Relations, Communications & Marketing, the laptop center and many others. At almost 100 years old, this building has stood the test of time and will surely continue serving the SNU community for many years to come. For further information stop by the Fred Floyd Archives on the first floor of the SNU Library. Prev PostWhat did we do before we invented electronic mail?